Check our Frequently Asked Questions (FAQs). Application Deadlines: Unless stated otherwise all applications must be submitted (or post marked) by 4 PM April 1st for evaluation for the next round of funding offers. All application materials are available on our website. Planning and Design applications are accepted year-round and evaluated as received. See details below. Construction Loans: Applications should apply for all infrastructure projects they are considering over the next four or five year period. VDH is in a position to fund large capital improvement projects (upwards of $10 million). Very large projects may need to be phased. The typical loan has an interest rate ranging from 1.5% to 2.5% with a 20-year term and 2.3% to 3.0% for a 30-year term. PEC & PER Requirements Revised: A Preliminary Engineering Conference (PEC) is required. The deadline to have a PEC with the appropriate ODW Field Office is March 1st (previously February 15th). Please contact your ODW Field Office as soon as possible to schedule a PEC. The submission (or waiver) of a Preliminary Engineering Report (PER) may be made a condition of the award (since 2017). VDH believes this allows greater flexibility in the Program and accommodates funding the PER as part of the construction award. Have a customer demographic where the median household income (MHI) is 80% or less than the state average MHI. Be experiencing financial stress. One indication may be a negative cash flow. Changes to Average Residential Water User Rate: In January 2019, the DWSRF Program revised the method used to determine the average residential water user rate in response to stakeholders’ input. VDH will use actual billing data to determine the average monthly residential water user rate. Previously VDH used the average usage data in combination with the waterworks’ current rate structure. Small Construction Projects: Revised 2019, VDH reserves the right to award 100% Principal Forgiveness to small projects to reduce program requirements and costs by avoiding additional costs associated with the loan program, and to expedite awards and disbursements in accordance with EPA requests. VDH reserves the right to limit 100% PF small construction projects to projects that have documented acute and/or chronic health issues. $0 per connection for actual to target ratio of less than 1.0. Unless they agree to adjust/raise rates to target. $12,500 per connection for actual to target of 1.0 to 1.25. $25,000 per connection for actual to target of greater than 1.25. Asset Management Plans (AMPs): In January 2019, the DWSRF Program made the following revision: To address aging infrastructure, Asset Management Plans for waterworks are now required to be completed (or updates if older than 5 years) as part of a project if a waterworks does not already have one. To encourage asset planning and replacement VDH will make available the lesser of the actual cost of an AMP or $15,000 as principal forgiveness if requested. Consolidation/Regionalization: In January 2019, the DWSRF Program made the following revision: VDH encourages the consolidation of ownership of small (or failing) systems to better leverage economies of scale and the capacity of existing/larger systems. VDH reserves the right to require regionalization for small systems to improve financial capacity as a condition of the acceptance and receipt of funds. Loans to consolidate (acquire ownership by transfer of assets and liabilities) waterworks may receive special funding if the waterworks to be acquired is considered failing, at-risk of failure, or has inadequate TMF capacity. Financial Capacity and Sustainability Promotion: In January 2017 the DWSRF Program made revisions to promote Financial Capability and sustainability. As a condition of funding VDH reserves the right to require the implementation of rate changes including but not limited to annual rate increases in an effort to build long-term financial sustainability at the waterworks. To build waterworks financial capacity VDH intends to offer reduced interest rates (up to 25 bps) for recipients that commit to compound annual rate increases of at least 2% a year for five years as long as any additional funds generated are for the use of the waterworks. Lead Service Line (LSL) Replacement Program: In an effort to accelerate the removal of lead exposure to drinking water the DWSRF Program has made funding available for the complete removal of the public and/or private portion of the LSLs. In conjunction with other available funds this program intends to provide up to $5,000 dollars as grant funds (of which up to $500 may be eligible as an admin fee) for each service line replaced on the homeowners side of the meter. The LSL includes pipe entry into the structure (up to and including a shut off valve) but excludes the premise plumbing. Design-Build Projects: In an effort to better serve our waterworks owners the DWSRF Program has made revisions to accommodate Design Build and other alternative project delivery methods. If you are interested please contact the DWSRF Director or Supervisor as early as possible to ensure you will meet our procurement requirements for the Design Build team. Refinance Loans; Rates Near Historic Lows: Given the extremely low interest rates VDH is encouraging publically-owned systems to consider refinancing local debt obligations related to drinking water infrastructure where construction was started and debt was incurred after July 1, 1993. The typical loan has an interest rate ranging from 1.5% to 2.5% with a 20-year term however; a 30-year term may be available for disadvantaged. A separate application form has been developed for loan refinance applications. See the application for qualifications. Improved Funding Chances: All waterworks owners with eligible projects are encouraged to apply. VDH’s Program was able to offer funding to all eligible construction projects with completed applications in state fiscal years 2019, 2018, 2017, 2016, 2015, and 2014. Planning and Design Grants (SRF & WSAG): Planning and Design Award applications for review and award will be accepted on a year-round basis. Priority will be given to Acute and Chronic Health needs and additional projects will be considered based on the availability of funds. Applications for eligible projects that are received early in the year and not funded will be held until on or about September 1 when all applications that have not previously been selected for funding will be reconsidered. The maximum award for the 2018 funding cycle is $35,000 and no local match is required. All Planning and Design Funded projects must be completed within 15 months from the offer execution date. Capitalization Grant Amount: VDH expects approximately $18 million will be available to Virginia under the DWSRF Capitalization Grant. As a result, VDH intends to award at least $25 million in DWSRF construction projects. 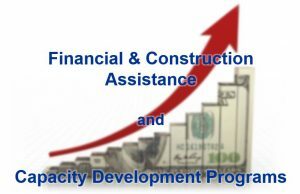 Building Financial Sustainability: One DWSRF Program Requirements is for waterworks to build long-term financial sustainability and have adequate financial capacity for additional debt for needed projects. As part of the application process VDH recommends all owners use the attached guidance information to evaluate the current financial health of their waterworks, to evaluate their ability to accept new debt, and to affect changes needed to grow revenues. As a condition of funding VDH reserves the right to require the implementation of rate changes including but not limited to annual rate increases in an effort to build long-term financial sustainability at the waterworks. To build waterworks financial capacity VDH intends to offer reduced interest rates (up to 25 bps) for recipients that commit to compound annual rate increases of at least 2% a year for five years as long as any additional funds generated are for the use of the waterworks. Readiness to Proceed and Timely Use of Funds: To promote readiness to proceed and timely use of funds VDH intends to offer reduced interest rates of up to 25 bps for recipients that can close loans within 12 months of the standard award date. The standard award date is the date that the majority of ODW award letters are mailed. Projects in the EVGMA only: To conserve water in the Eastern Virginia Groundwater Management Area (EVGMA) created pursuant to the EVGMA of 1992, VDH reserves the right to give precedence to water projects that do not involve withdrawal of groundwater from the coastal plain aquifer over those projects that do withdraw groundwater in the EVGMA. VDH will only apply this evaluation to any equally ranked projects when both are located in the EVGMA. APPLICATIONS —Please note application review deadline above.